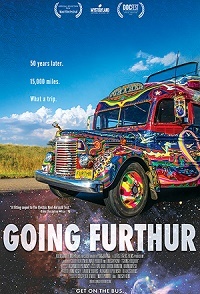 Fifty years after the iconic first Trip, Ken Kesey's son Zane took the Furthur Bus - and his father's legacy- back on the road, for its longest running tour in history. Armed with a new band of Merry Pranksters, the Furthur bus traveled over 15,000 miles in 75 days, riding into music festivals, community events, tribal gatherings and national landmarks, reestablishing itself as a symbol of radical self-expression and cultural revolution all across the country. Q & A with the Film's Directors & Original Merry Prankster George Walker. Also featuring a special live musical performance from one of the films composers, playing multiple tracks that are in Going Furthur. Pre-show music by: The Poor Man's Jug Band featuring Banjo Larry.